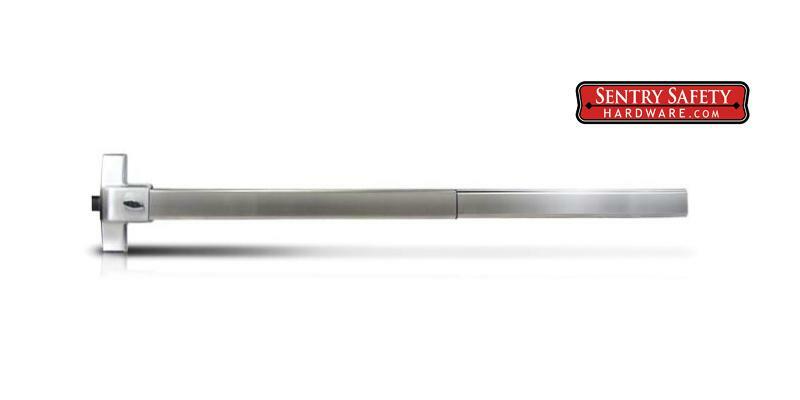 • Glass doors with a stile (metal frame) of at least 1 3/4"
• Doors with a maximum width of 40"
• Doors with a minimum width of 25"
• Doors with a maximum thickness of 3 3/8"
Dead Latch is stainless steel, 5/8"
The panic bar beyond the push pad is hollow square tubing. The bar comes from the factory 40" long. To modify this length simply cut the excess tubing off the end of the bar that you do not need. There is an included cap that will go on the end of the panic bar where the end is cut. Cutting can be done with a hack saw and can reduce the length of the bar to 25". To switch mount remove the head cover from the bar by removing the four screws. Unscrew the flathead screw that is below the spring to disengage the top piece from the panic bar. Loosen the screw the spring is attached to and remove the spring. Engage the spring to the opposite screw, tighten and attach to the opposite hole. Screw the flathead screw on the opposite side to reengage the top piece to the panic bar. 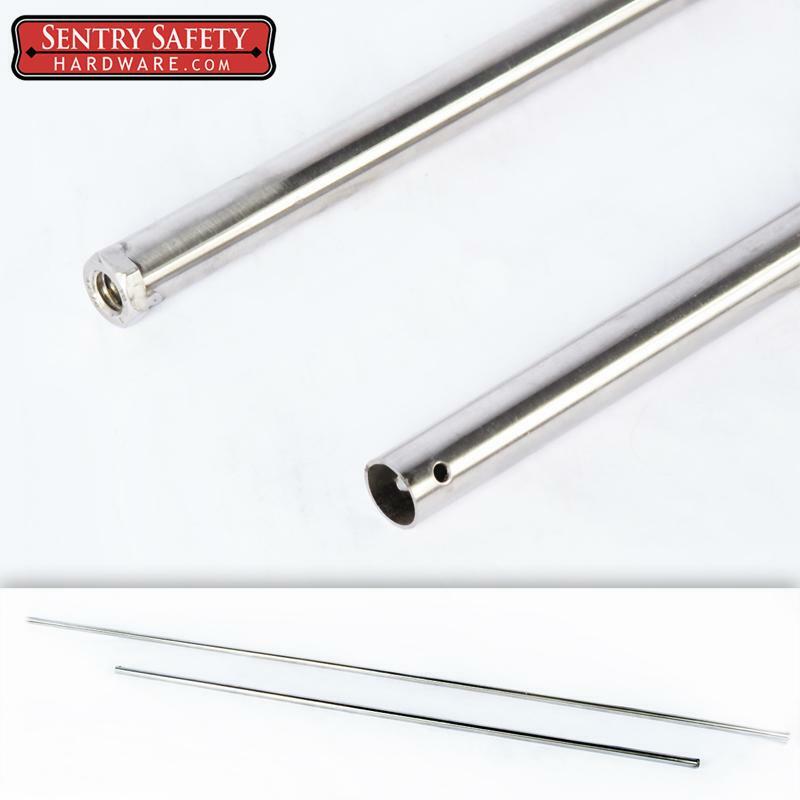 500 Series Panic Bar The 520 series panic bar can be used in unison with the 500 series panic bar in dual doors. 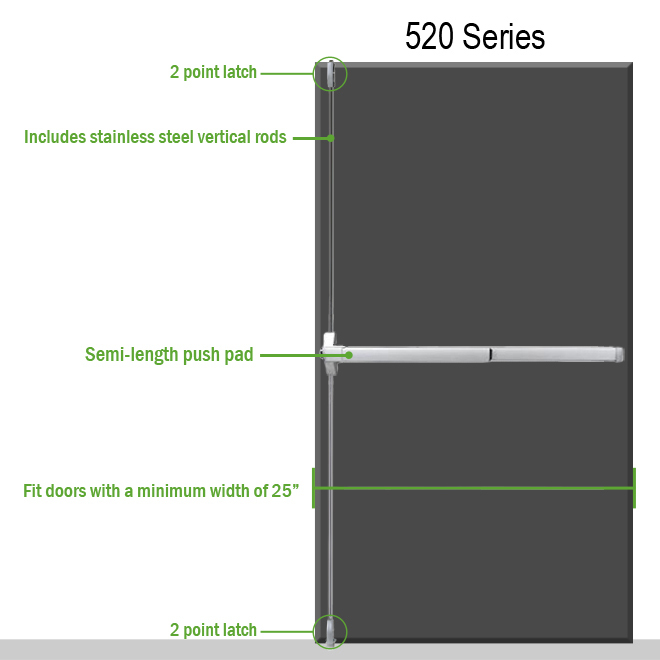 The 520 series top and bottom latch will lock one of the doors to the frame and the 500 series bar would lock the second door to the first door. This is preferable when dual doors overlap. If your dual doors overlap, using a 500 Series Panic Exit Bar will allow you to open both doors when pressing the 520 series push bar.